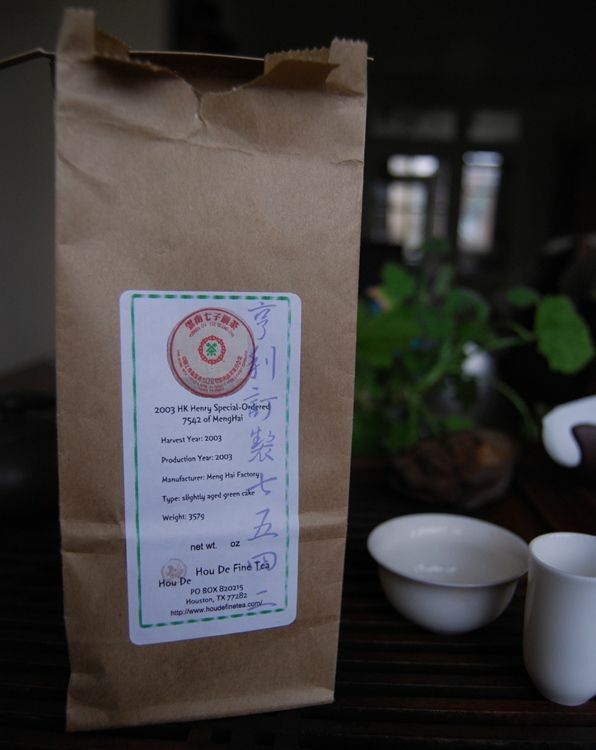 This is the second of two samples kindly provided by Vicony Teas, an outfit that operates from Anhui Province. 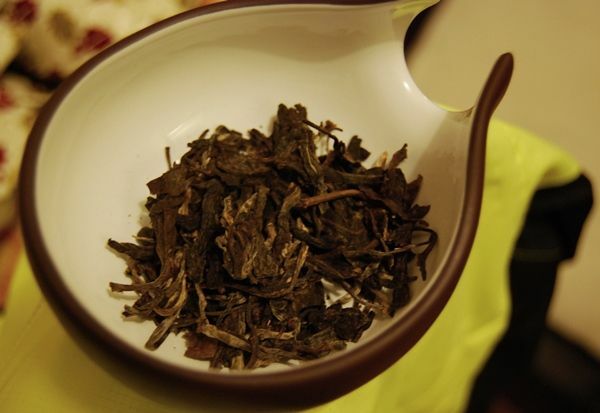 This shuixian-varietal yancha comes from Foguoyan [Buddha County], the same Wuyishan area from which the company's Qidan Dahongpao derives, which I enjoyed so much. Older wulong requires refiring from time to time, to keep the moisture out. It is this relatively high level of maintenance that prevents me from keeping older examples in any quantity. Given my ability with such things, I'd be certain to ruin my tea, and find out about the mistake only after it was too late. Hence, I stick to aging pu'ercha: leaving something on a shelf is something that even I can manage. 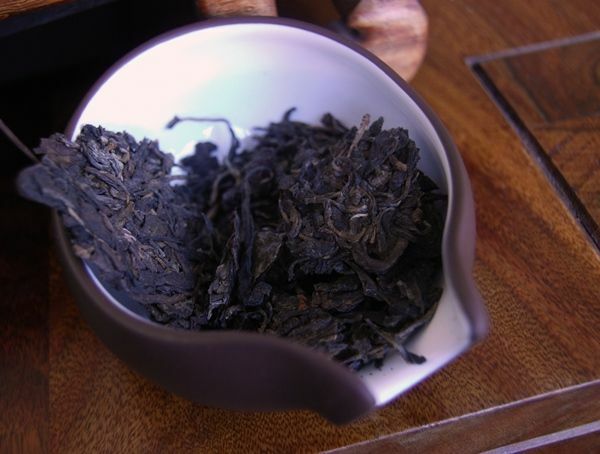 This particular shuixian [approximately shway shee'an] has been 60% oxidised, which comes across in the image above. The long, dark leaves have a gentle aroma of musky, sticky caramel. 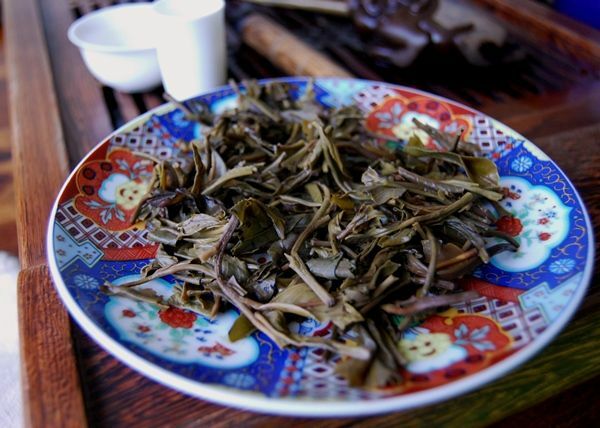 As I've mentioned before, I pile a large quantity of leaves into the pot when brewing yancha. It's hard to overbrew, and tons of leaf therefore allows a richness of character. Even then, with a full pot, this tea was a touch on the quiet side, requiring long infusions right from the start in order to get some real character into the soup. Brewed for anything less than a significant period, it tastes a little empty, and is dominated by its roasting. 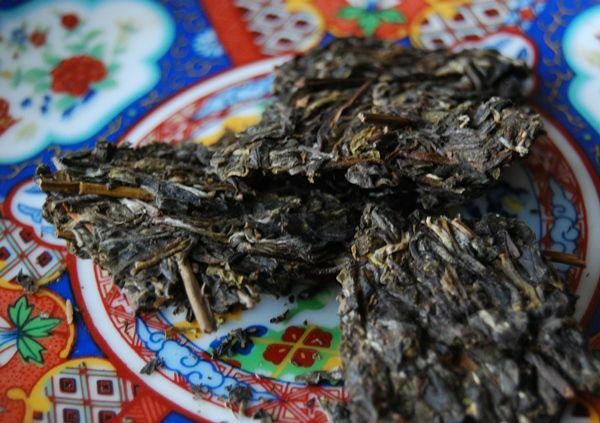 This is always a danger for old wulong: it can sometimes taste of nothing more than its coating of roast, with the flavour of the leaf withering beneath. Keeping the infusion time up, however, yields a pleasant cup of warming, clean sweetness that continues in the sticky caramel manner of its aroma. 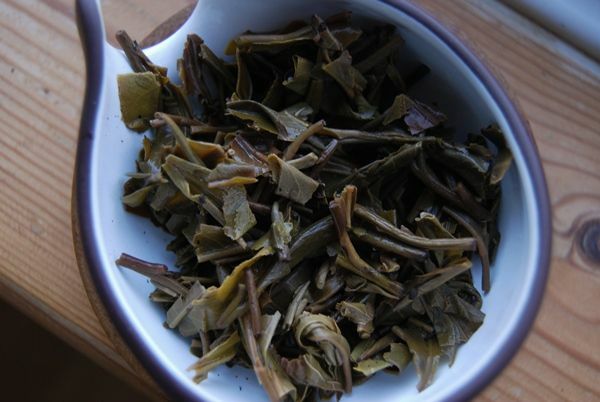 With longer infusion times, the venerable old leaves give up a reminiscence of their old, original butteriness. 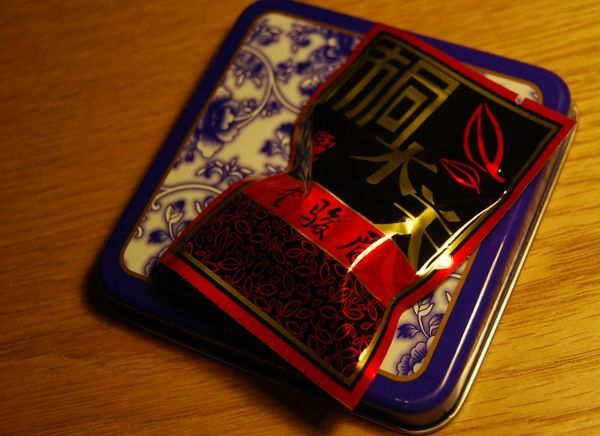 Like the Qidan Dahongpao from the same company, it has a noticeable numbing effect (in a pleasant way) on the tip of the tongue, which, likening it to my experience of pu'ercha leaves, I assume to be indicative of good provenance and corresponding content in the leaves. It doesn't take long for this tea to "revert to form", however, and become dominated by its roasted characteristics. While I had an enjoyable session, I suspect that this isn't a yancha that I would pursue in any great volume, and is a cautionary tale for those of us interested in older wulong. 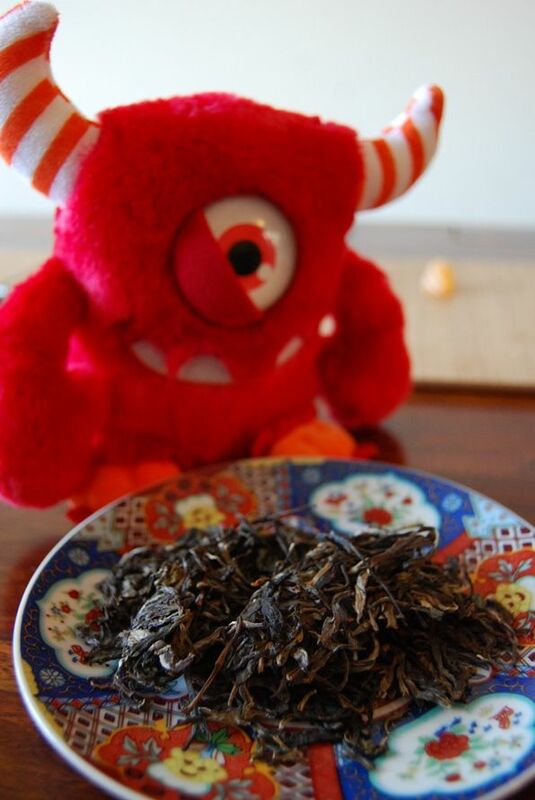 Thanks again to Richard for the opportunity to explore this mature tea. Good tea can come from the most unexpected of places. I know that writing in a second language can be a pain; some days, I wonder about my ability to write even in my first language. So, I try to help others with their writing when time allows. This particular tea was an unexpected gift given by a Chinese colleague whose abstracts for some forthcoming publications I had revised. His English was really very good, and so my additions were but minor tweaks around the edges. 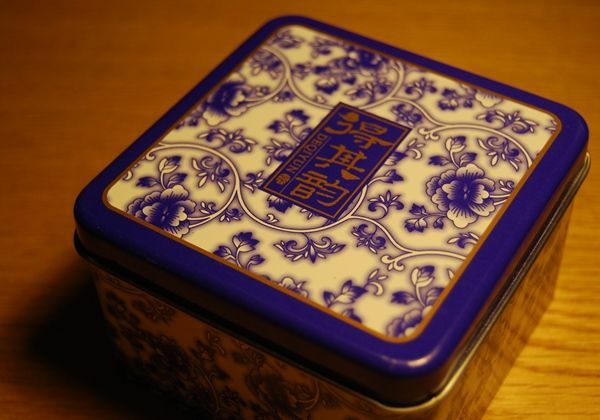 His gift was this charming little box of hongcha. "This is some of the best!" he grinned. I got excited about the tea; my dear wife was rather more interested in the pretty box, pictured above - and who can blame her? It has the style of a charming piece of porcelain. I understand that its destiny is to store something of infinitely greater value to her than tea: her critically-important supply of "Werther's Originals" toffees. 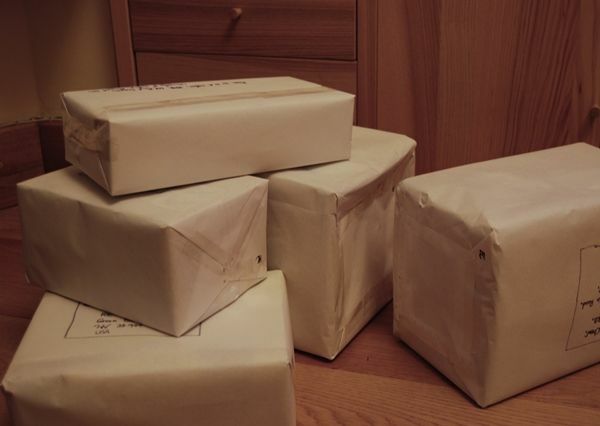 If I've recently sent you a box of samples, then you may have a packet included as shown above. It reads "Tongmuguan Jinjunmei", where Tongmuguan [tong moo gwan] is a pass in the Xingcun [shing-tsun] Village area of Chongan County, where lapsang souchong originates. One aspect of this tea that doesn't come across in the above photograph is precisely how tiny are these leaves. They really are insy-winsy, being about 2 or 3mm in length. The "grade" must be extraordinarily high, because I don't believe that I've ever seen tea leaves this small, from any genre of tea. With pu'ercha, for example, the "grade" matters little, and cakes made entirely of small leaves may be missing out on some of the robust characteristics imparted from a robust blend of all leaf sizes. However, in hongcha and lucha, high "grade" (i.e., tiny leaves) can make a difference in terms of potency and definition of character. There is a reason, after all, why such comically small leaves attract such high buying prices, and it cannot be explained entirely by tea-buying fashions. Drinking hongcha is an excellent excuse to dust off my beautiful Xishi pot (originally bought from Teamasters). I don't drink a huge amount of hongcha, but when I do, my little Xishi comes along with me. 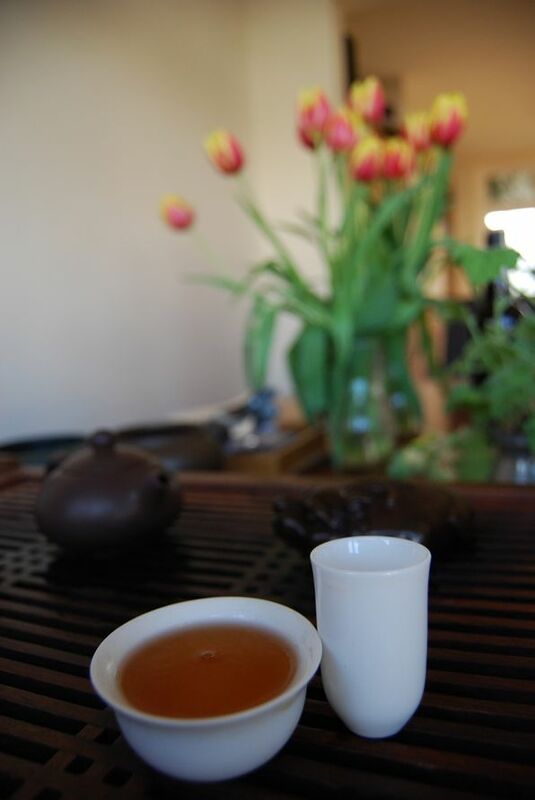 Such sessions are a special treat for me - I am happy with even the most rudimentary of hongcha, and so you can imagine my elation when trying such a great example. This hongcha is not sweet. It is not the dainty, feminine affair that we might expect from its fussy little leaves. Instead, it is a masculine, robust, complexity of bass flavours wrapped up in an almost gelatinously thick soup. 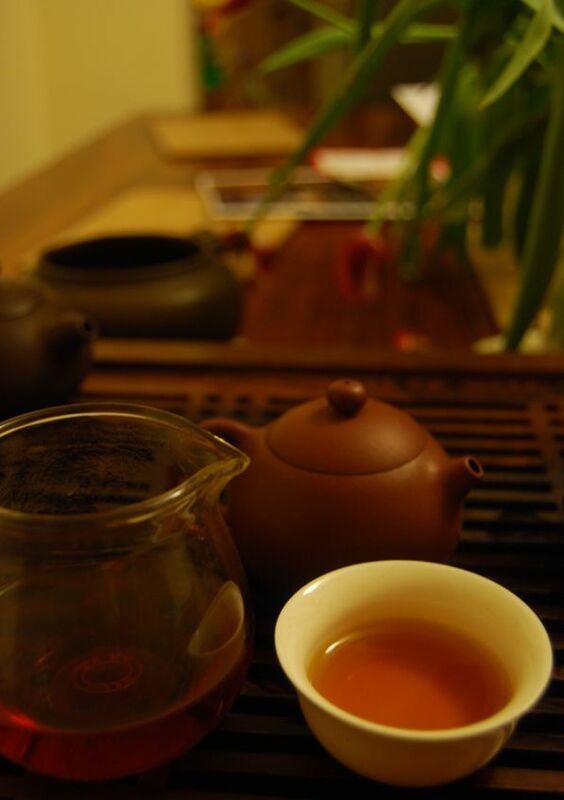 It reminds me of the hongcha version of good, old pu'ercha, in its texture and huigan [returning sweetness in the throat]. The little leaves continue to give thick, complex, malty, sweet infusions throughout the morning, leaving me impressed by the longevity of such small things. 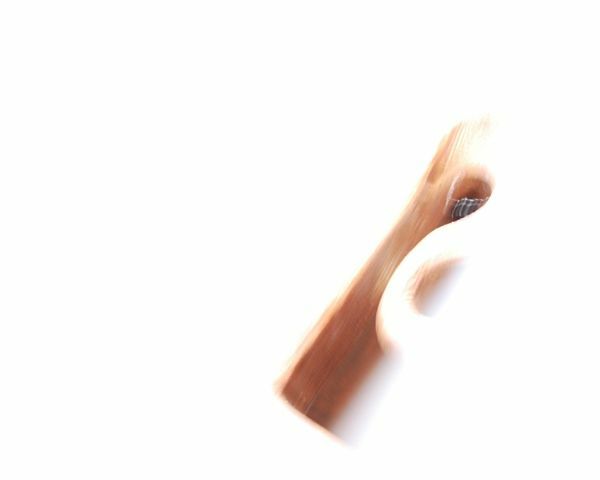 The comparison with good pu'ercha remains as the infusions pass, with its thickness and satisfactory grip on the throat. 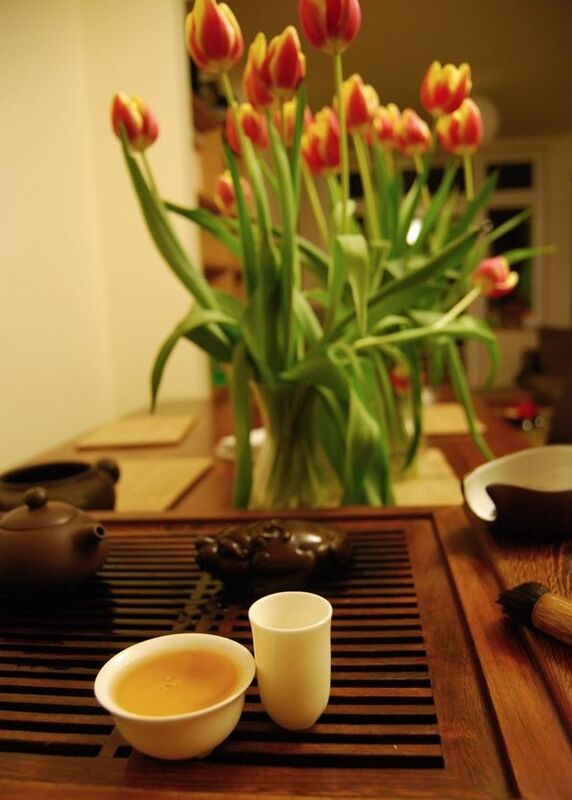 There are not many hongcha in this style, and it is quite an education to drink such a tipple. 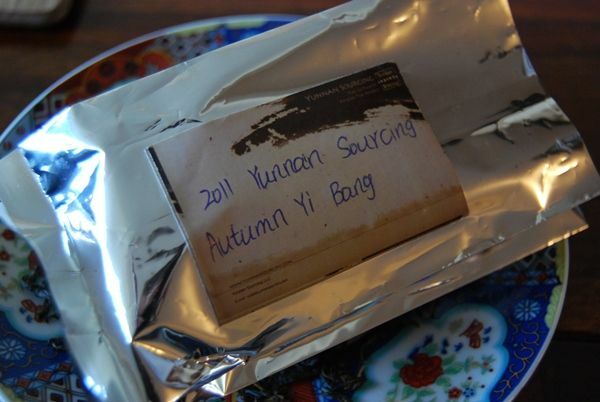 Last year, the 2010 Yibang was my runner-up from the autumnal range at Yunnan Sourcing, which I bought to console myself after losing out on the 2010 Xikong. Opening the sample bag (pictured above) delivers an aggressive, fruity aroma. In last year's cake, I found activity - moreso than in the Xikong from the same year. From the aroma, I wonder if the same relationship will exist between the two in 2011 - they are from neighbouring areas, of course. 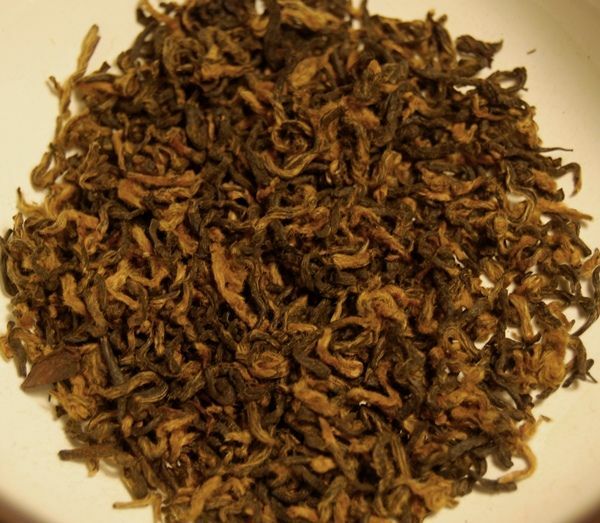 Their close origins mean that they share the same "xiaoye" [little-leaf] type of maocha; as with the Xikong, Scott has selected a robust blend of all types of leaf, shown below. The yellow-green soup is reassuringly pure, an unadulterated; it turns deep orange only after the slow action of the air. As it is with many hand-made cakes from YS and EoT, there is an obvious buttery character which, I assume, comes from the wok in which the leaves are heated. 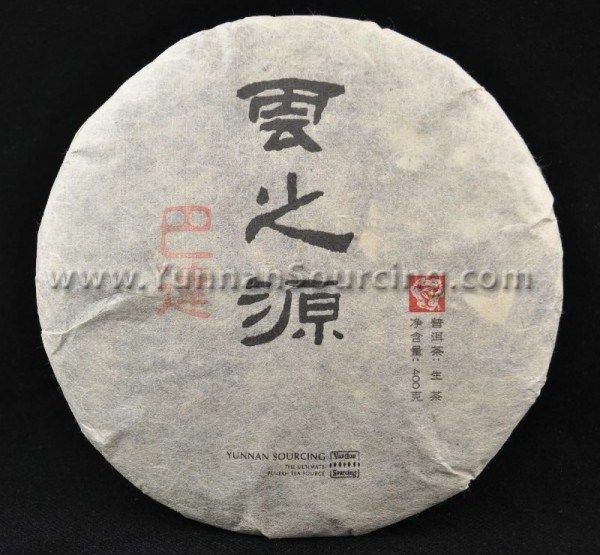 If left in there too long, that characteristic can become almost roasted; kept at the right level, as it is with this Yibang cake, it is a welcome addition to the finish in the throat. It progresses slowly towards the back of the mouth, in no apparent hurry, and delivers a good fruit-like sweetness near the end. The sun comes out, for the first time in ages, turning the grey English winter into a welcome orange. When you live this far north, as do we Anglo-Saxons, the appearance of the sun is something to treasure. One must be careful with new pu'ercha; the opening infusions can be all complexity and finery, influenced as they are the by the "high notes" that have not yet darkened and deepened through age. The real test of a leaf comes from its later infusions, perhaps after the first three or four have passed. By this time, the lightness of the transient characteristics has worn away, and the raw material of the actual leaf is revealed - and it is this that, in my experience, most effectively indicates how it will be after ten or so years, once the wildflowers and honey have gone. So, I am a little disappointed to find that the third infusion, and all subsequent, take a noticeable nose-dive, as the fruity sweetness recedes. We are left with a basic sourness, which is leafy and "brown". I did not observe such a degradation in the 2010 cake; certainly, it is enough to dissuade me from buying any from this year. 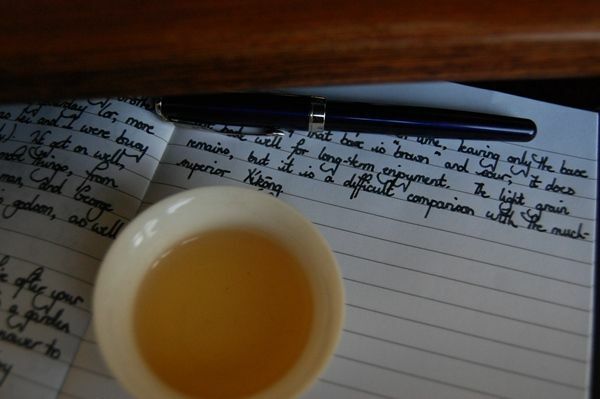 In my diary, I wrote, "After ten infusions, the Yibang seems less than special. I will stay with buying only Xikong cakes so far." Wuchidao whonow? 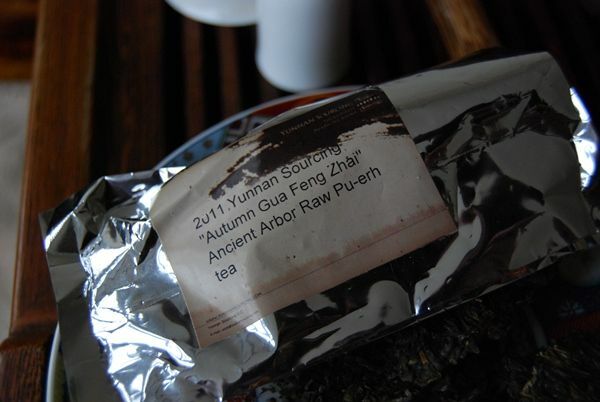 This is a generous complementary sample, included in a recent purchase from Yunnan Sourcing - thanks to Scott for the gesture. This is one of those random, small-label productions that crops up every now and again; in this case, Scott bought a bunch of them from a friend in Dongguan, where they have been stored in the mighty Guangdong humidity for some years. I appreciate the touch of storage in a super-humid, environment, and am consequently something of a fan of Hong Kong and Singaporean pu'ercha. 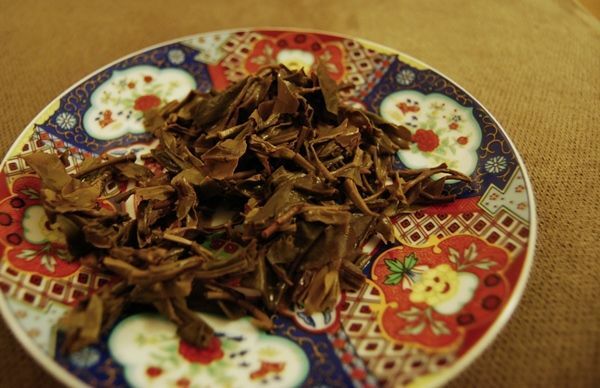 The dark, medium-sized leaves (shown above, although somewhat less scarlet in real-life) have the spicy, mineral aroma that I typically associate with south-China storage. It is a Lincang production, which is one of my favourite areas for good tea, but which often don't turn up in "traditionally stored" format. Thus, this session offers something of an opportunity to try an old favourite from a slightly new angle. It is a clean cake, and is both sweet and vivid. The finish is lightly mouthwatering, which causes me to think that it is still "alive". 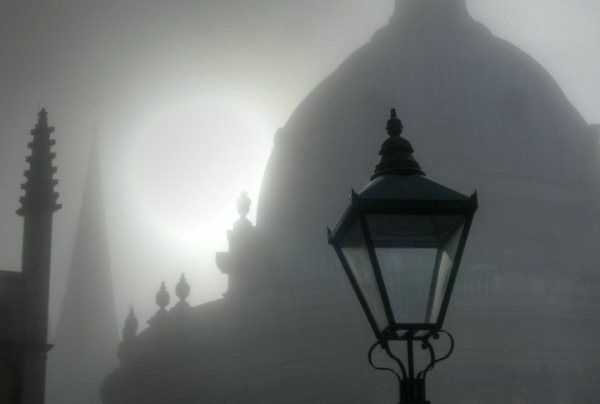 While not heavy, nor rich, its clean, sweet, humid nature is most enjoyable. The southern spiciness marches on solidly for many infusions, deviating little. This cake is inexpensive, at $35 - bearing in mind that it will be nine years old this year. Scott is typically fair in his pricing, and this low price is appropriate for what is, ultimately, a rather simple tea. It is warming, and enjoyable, and humid... but not the most complex cake you'll ever try. I appreciate the opportunity to enjoy it at home, but don't see myself pursuing it much further. "Try the Chaqi", Scott said. "You'll like it", he said. After the slew of recent autumnal cakes, and the weeny xiaobing from his spring range, I am rather encouraged to try something from a chunky 400g ubercake. Scott notes that this cake derives its maocha from three separate Bulang-area villages, and which are mixtures of spring and autumn batches. Its leaves are, on the whole, rather small (pictured above), but they have a clean and punchy aroma that tries its hardest to wake me from my sleepiness, induced from my dear son waking us up all night. Something with "chaqi" would be very welcome, right now. It is yellow and clean, as shown above, and the aroma is low, thick, and encouraging. 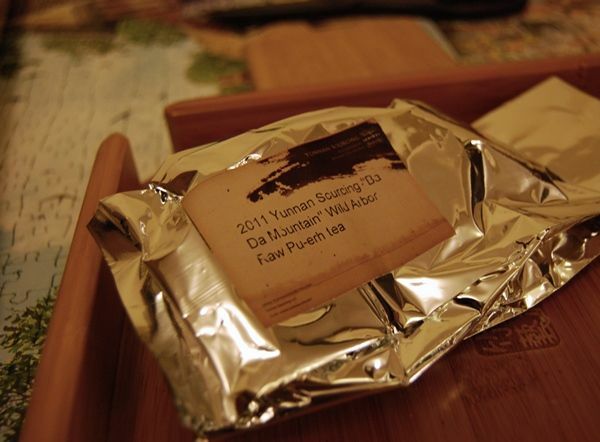 Bulang is a huge region, and so contains many different characteristics in its teas, but I often find a heavy, leathery lowness to be found in some of the better examples. This blend manages to recreate that heavy, bass body, and bundles it up with a sweet, gripping finish. 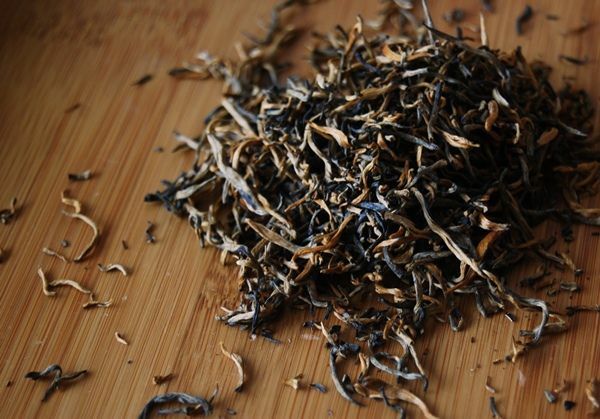 It remains cooling, strong, and deliciously filled with low, almost tobacco-like, richness. There is a small hint of "brown" (which I usually associate with lesser, plantation leaves) that starts to dominate from the fifth infusion onwards. This is a pity, because, if its initial purity and aggression could be maintained, it could rival the 2011 Sanhezhai in my affections, when it comes to Scott's blended teas. Despite its divergence into dodgier territory in later infusions, it cannot be denied that one gets a lot for the low asking price of $25. The "brown" notes dissuade me from holding any in our collection, but I appreciate it for its direct charms, particularly in the first few infusions. Many thanks to Teavivre for this sample of dianhong, which gives me a much-needed excuse to get some air to my neglected hongcha pot. 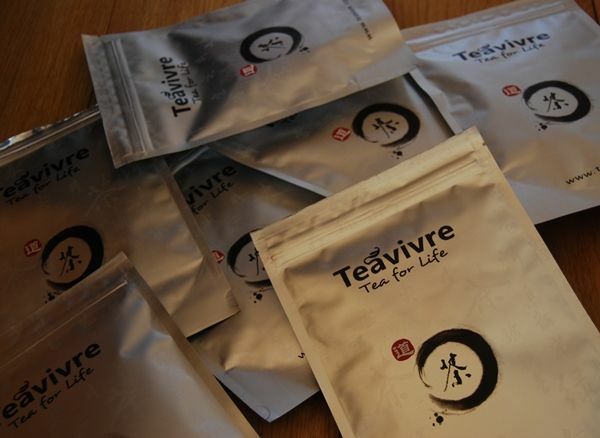 Pictured below, the rather nifty sample-bags, each of which contains a little pouch of tea. I've been rather impressed by the sheer volume of information presented on the company's web-site for each of the teas that they sell. 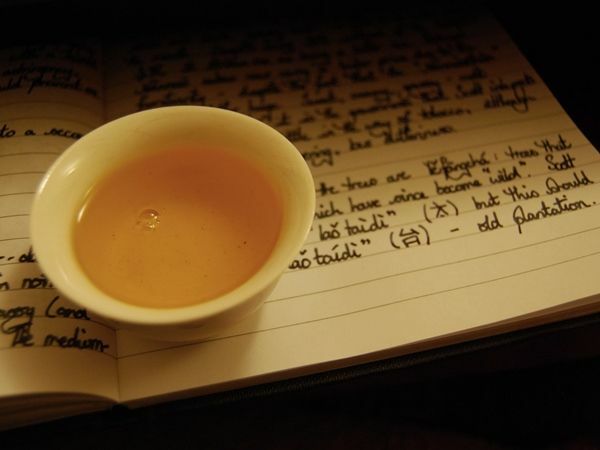 Some of it is fascinating, some of it needs to be taken with a pinch of salt ("this black tea has about 20% of the caffeine of a cup of coffee"), but all of it is well-presented and welcome. 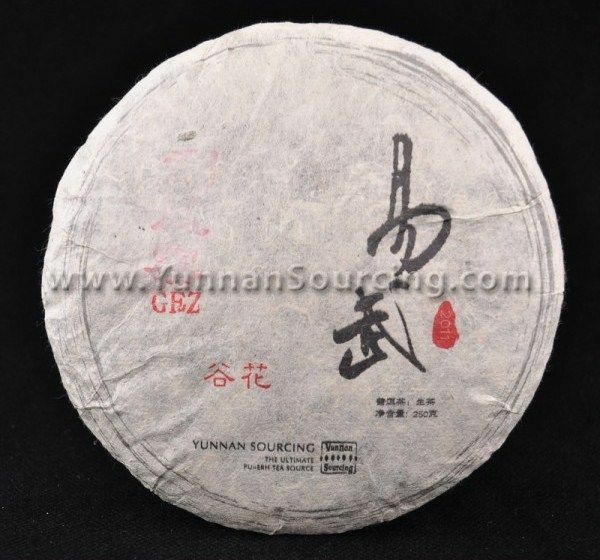 The web-page tells me that this tea comes from the Fengqing Sunning Tea Co., based in Fengqing County of Lincang, which is a town also home to the eponymous company that is credited with the first dianhong (and which now does a nice line in Lincang pu'ercha). It makes sense to include "Fengqing" in your company's name if you're making dianhong, for the same reason that pu'ercha companies sometimes include "Menghai" in their names. 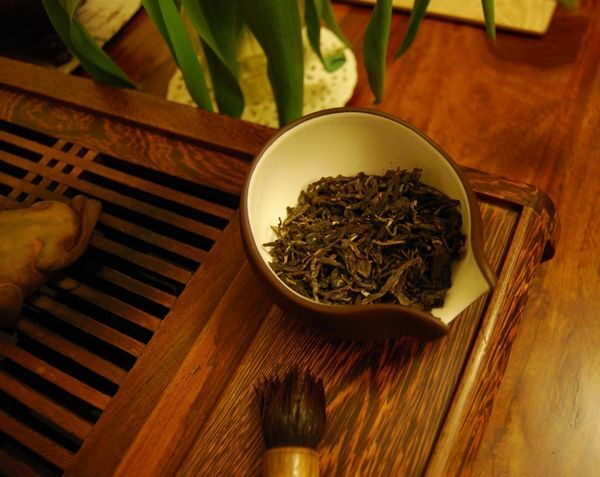 The leaves of this tea really are rather lovely; the photograph above does not do justice to the long, golden tips that have been included, which have a pure and dazzling colour that is almost yellow. Its aroma is a misleading, candy-like sweetness. 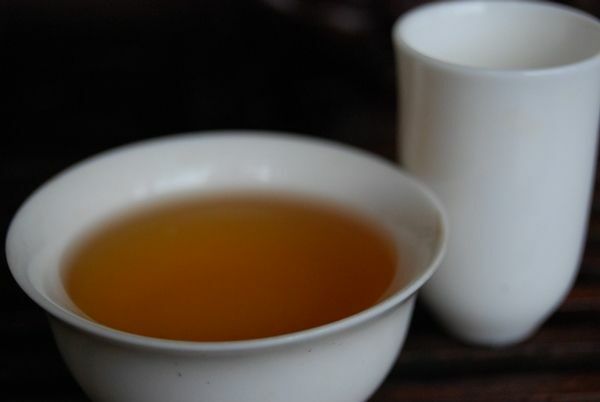 I use the term "misleading" because this is dianhong, which is the Chuck Norris of hongcha. N.B. : this is meant not in the sense of an old man spouting unpleasant right-wing views, but rather the Chuck Norris of a bygone age who was the nemesis of Bruce Lee in Way of the Dragon. 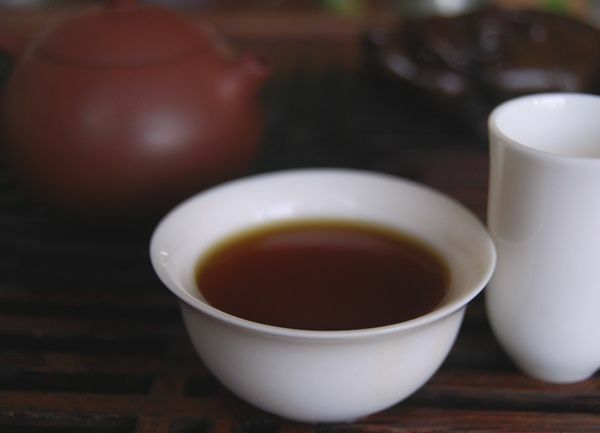 Dianhong is therefore a robust, almost meaty hongcha that has little truck with feminine characteristics such as candy-like sweetness. Dianhong is one of my favourite teas, after pu'ercha, along with Qimen hongcha ("Qihong"), Sichuan gongfu, and (Fujian) Bailin gongfu. It's a chunky hongcha. For the first two or three infusions, this dianhong is faultless, like Chuck Norris in the opening bouts of the finale of Way of the Dragon. It lands a series of solid, uncompromising strikes, including a surprisingly robust kuwei [throaty bitterness] and something resembling a huigan [returning sweetness in the throat], both of which I usually only get from pu'ercha. 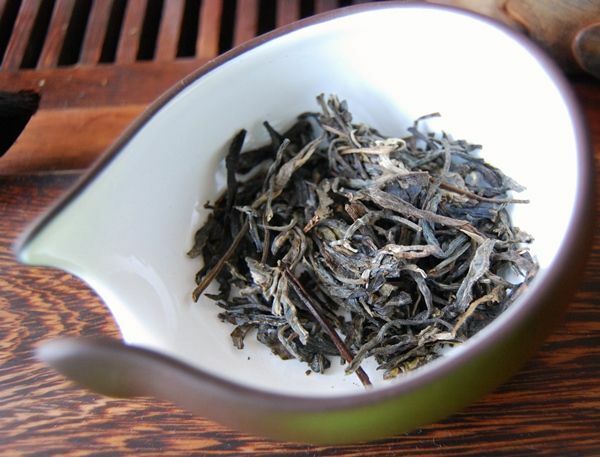 It has an undercurrent of meaty maltiness, and the characteristics of a rather accomplished hongcha. Unfortunately, rather like Chuck Norris in the finale of Way of the Dragon, it can't go the distance: by the time we're onto the third and fourth infusion, the infusion times have to be drawn out to long periods, in order to coax some contents out of the leaves. 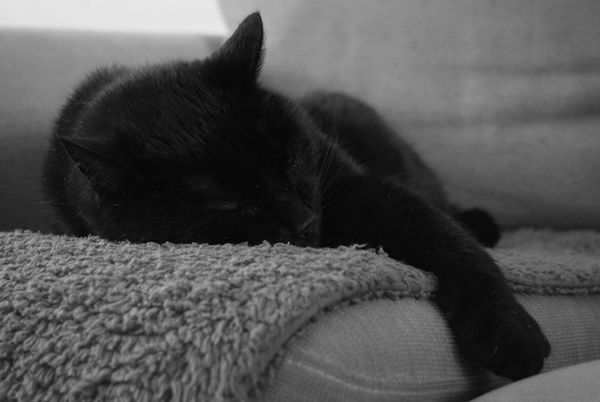 It seems that they peaked too early, and put too much into those early rounds, without thought of the longer encounter. 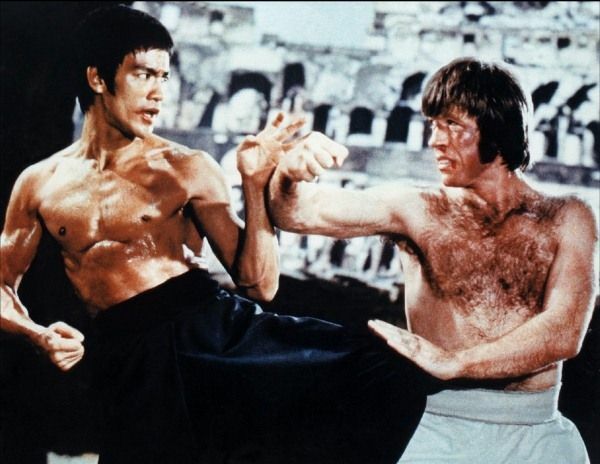 We all know how it ended for Chuck Norris' character at the hands of Bruce Lee. Ouch. It is a very good little hongcha, but three infusions isn't really enough for me to consider it a great hongcha. The price is $17/100g, which is quite high. 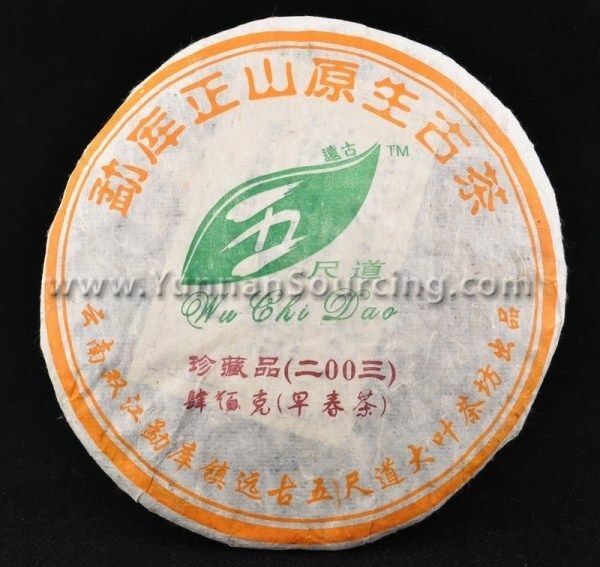 Recalling that hongcha is exceedingly inexpensive in most Mainland markets, it really needs to be a little more special than this to command such a towering price. Thanks again to Teavivre for the excellent session. Badashan - where would we be without you? We wouldn't be able to make "Bada-bing!" jokes, that's for sure, and the world would be all the poorer for it. I have to confess in advance that I don't find myself thrilled by Badashan cakes. They can be enjoyable and refreshing, in their grassy way, but I tend to avoid them in favour of tea from other regions, given the choice. This could be because I was drinking Badashan pu'ercha every day for several months in my office, some time ago, back when I couldn't drink tea at home (due to renovations). That cake was a special run from Menghai Tea Co., which scarred me so badly that I don't seem to have written about it here at the Half-Dipper. Perhaps a revisitation could be cathartic. 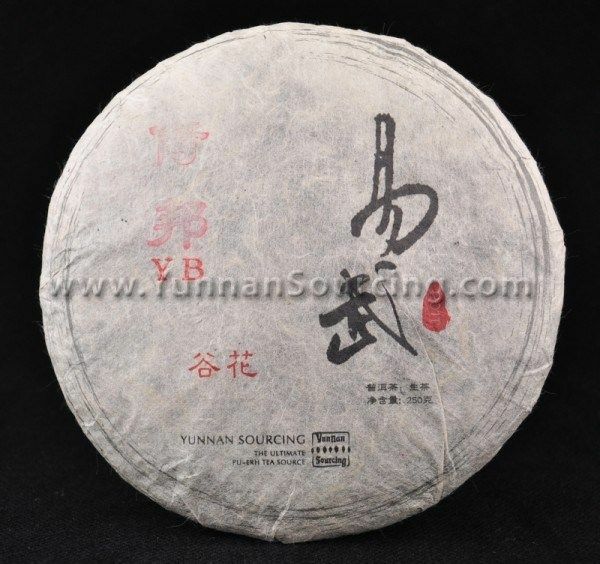 This version from Yunnan Sourcing is just $29, for a whole proper-sized cake, which is not expensive. The medium-sized leaves, pictured above and below, are (you guessed it) grassy. The scent is long and clean, which makes for a good first impression. Scott notes "tobacco and pine", but I don't seem to agree. To me, this cake is primarily "creamy and smooth". It is pleasantly tart (perhaps indicative of Scott's pine), but has a solid and dark base of ripe grass. While less expensive than some of Scott's springtime range from 2011, it is perhaps more potent than many of its cousins, and lasts plentifully long in the mouth. Such endurance is to be commended - it holds the attention. In its way, it is a stable, workhorse of a cake, soldiering on with a constant creamy grassiness for infusion after infusion. The leaves have a great deal of content to deliver, which bodes well for future years. Ultimately, this is a very decent Badashan cake which is highly typical of the area. It could be a good buy if you'd like to explore Bada characteristics, but it's not really my "cup of tea", excepting its potent longevity. However, purchase of this cake does guarantee you the opportunity to say "Badabing". That, surely, must be worth something. Look upon my Guafengzhai, ye mighty, and despair. All the best tea comes in little air-sealed bags. It's what the emperor would have wanted. If ever there were a rival to the all-dominating presence of Laobanzhang, in the wide world of pu'ercha, then surely Guafengzhai must be it. Never has so much been paid for so little by so many. The reason for this is, of course, that Guafengzhai can be absolutely lovely. 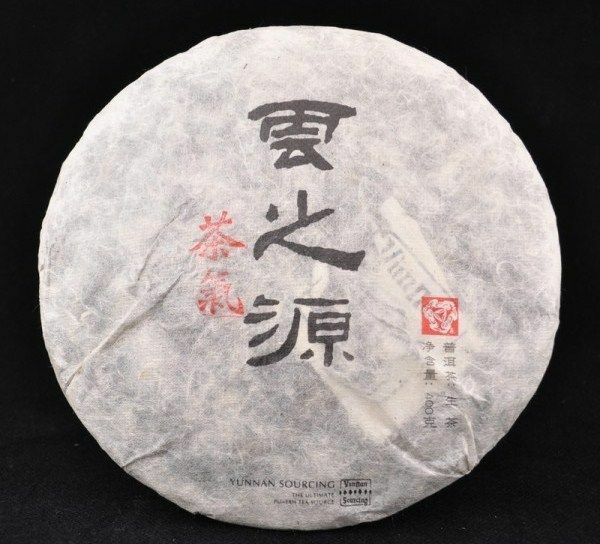 There is a sublime character to a true laoshu Laobhanzhang; I've not had many, but I've had enough to cause me to weep every time a mainstream label tries to sell something that claims to be a "Laobanzhang" cake. Likewise, good Guafengzhai is hard to find. Scott's cakes from Yunnan Sourcing are often very reliable, although I don't recall have a Guafengzhai from him since the 2009 version (back in the days of colourful wrappers). I enjoyed that cake more than the rest of the 2009 series. This cake is, however, an autumnal cake, which might count as being a bit of a shame (because we can expect less potency and character than the springtime versions), but might also be an opportunity to have a decent cake for the typically lower prices of autumnal cakes. In this case, the price is $36 / 250g, which is reasonable - perhaps on the borderline of being pricey. 250g makes this a xiaobing, of sorts, whereas a full bing equivalent would cost around $54. Scott is usually very fair with his prices, and the fact that this cake is priced less expensively than his 2011 Xikong and 2011 Yibang autumnal cakes suggests something to us. 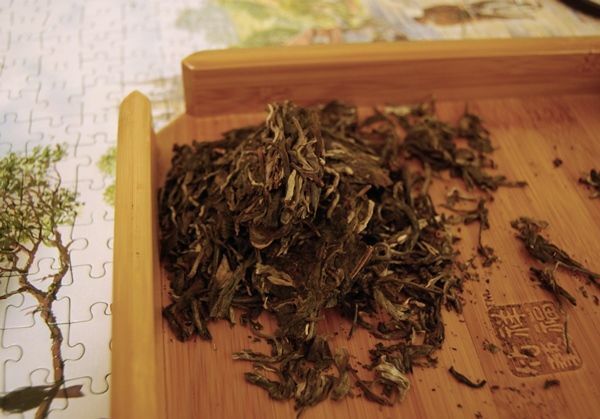 The medium-sized leaves have a richly sweet aroma that gets my hopes up, right from the start. 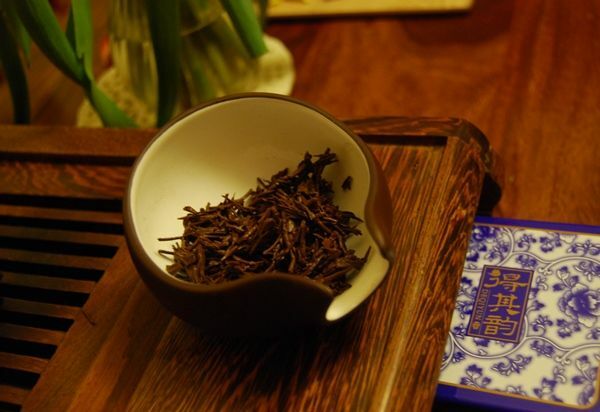 As ever, the opening infusion is a marvellous complex of characteristics; here, we have a heavy base of grain, plenty of Yiwu sweetness, and a solidity of texture. As Scott's notes suggest, there are hints of wildflowers in the aroma after the swallow. The question is whether or not subsequent infusions can live up to this first-infusion beauty.